The tax treatment of investment income varies partly based on whether the income is in the form of dividends or interest. Qualified dividends are taxed at your favorable long-term capital gains tax rate (currently 0%, 15%, or 20%, depending on your tax bracket) rather than at your ordinary-income tax rate (which might be as high as 39.6%). Interest income generally is taxed at ordinary-income rates. 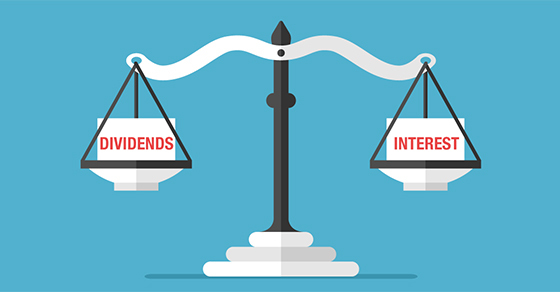 So stocks that pay dividends might be more attractive tax-wise than interest-paying income investments, such as CDs and bonds. While tax treatment shouldn’t drive investment decisions, it’s one factor to consider — especially when it comes to income investments. For help factoring taxes into your investment strategy, please contact us.